Premium abrasion hook and loop (Velcro) sanding sheets. Perfect for continuous use multi-tool sanding jobs that require quick attach hook & loop sandpaper. Featuring a full resin-over-resin grain bonding supported on a strong backing. This paper also utilizes premium top grade hardened aluminum oxide grit which outperforms regular retail grade paper. The quality controlled grain distribution provides a consistent work piece finish. Non-perforated sheets can be used universally on almost any multi-tool with a hook & loop sanding pad (3-1/8" x 3-1/8" tip to tip). Premium multi-tool high abrasion performance hook and loop (Velcro) sanding sheets. Perfect for multi-function oscillating sanders that require quick attach hook & loop sandpaper. The durability of this paper is resistant to material build-up or loading and can easily withstand the high temperatures associated with oscillating tool sanding. Bosch & Makita owner's please note: These sanding sheets are a multi-tool common sizing. 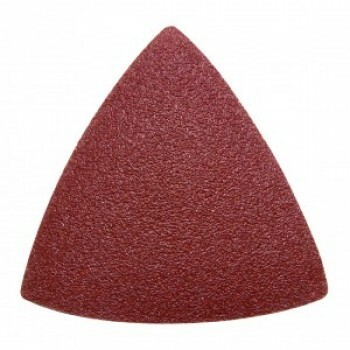 The tip to tip dimension of these triangular sanding sheets are a 1/2 inch too small for a factory issued Bosch/Makita sanding pad.